Civil and Environmental Engineering › CEE Directory › Civil and Environmental Engineering Full Time Faculty › James H. Garrett, Jr.
James H. Garrett, Jr.was named provost and chief academic officer of Carnegie Mellon University, effective January 1, 2019. 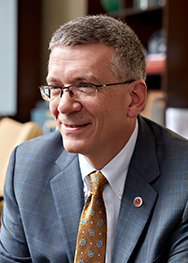 As the university's chief academic officer, Garrett is responsible for leading CMU's schools, colleges, institutes and campuses and is instrumental in institutional and academic planning and implementation. A member of the faculty since 2007, James H. Garrett, Jr. became Dean of Carnegie Mellon University’s College of Engineering in 2013. Immediately prior to that, he spent six years as head of the Department of Civil and Environmental Engineering. Dean Garrett is Carnegie Mellon plaid through and through, having received his B.S. (’82), M.S. (’83), and Ph.D. (’86) degrees in Civil and Environmental Engineering from the institution. He joined the faculty of the College as an assistant professor in 1990 and was promoted to full professor in 1996. Dean Garrett has served in other administrative roles including Associate Dean for Graduate and Faculty Affairs (2000-2006) and Acting Dean (2004), as well as faculty co-director of the Smart Infrastructure Institute, a research center aimed at developing sensing technology for construction and infrastructure systems. Throughout his research career, Dean Garrett focused on how sensors and data analytics can make our cities more adaptive and efficient. This approach aims to give our built infrastructure the ability to detect and report on problems directly to the humans charged with maintaining those structures, allowing for more proactive and cost-effective infrastructure management. As Dean of the College, he has demonstrated an unprecedented commitment to the integration of research and teaching across engineering, science, arts, business, and other disciplines, to effectively produce a generation of creative and technically strong engineers who are equipped to pioneer solutions to global challenges. Dean Garrett’s focus on bringing the collaborative spirit of making to the College continues to build on the unique strengths of Carnegie Mellon’s students and faculty. Among his many recognitions and awards, in 2018 Jim was awarded the title of Distinguished Member of American Society of Civil Engineers, the highest honor available to Civil Engineers. E. B. Anil, B. Akinci, J. H. Garrett, O. Kurc. 2016 “Information Requirements for Earthquake Damage Assessment of Structural Walls”, Adv. Eng. Inform., Vol 30, pp. 54-64. E. B. Anil, B. Akinci, O. Kurc, J. H. Garrett, Jr. 2015. “Building-Information-Modeling-Based Earthquake Damage Assessment for Reinforced Concrete Walls”, J. Comput. Civ. Eng. S. Taneja, B. Akinci, J. H,. Garrett, Jr., L. Soibelman. 2016. “Algorithms for Automated Generation of Navigation Models from Building Information Models to Support Indoor Map-Matching”, Autom. Constr., Vol. 61, pp. 24-41. S. Chen, F. Cerda, P. Rizzo, J. Bielak, J. H. Garrett, Jr. and J. Kovačević. 2014. “Semi-Supervised Multiresolution Classification Using Adaptive Graph Filtering with Application to Indirect Bridge Structural Health Monitoring”, IEEE Trans. Signal Process., 62(11), pp. 2879-2893. Taneja, S., Akinci, B., Garrett, J., Soibelman, L., Jr., and Karimi, H. 2014. "Effects of Positioning Data Quality and Navigation Models on Map-Matching of Indoor Positioning Data." J. Comput. Civ. Eng., 04014113. Liu, X., Akinci, B., Bergés, M., and Garrett, J., Jr. 2014. “Domain-Specific Querying Formalisms for Retrieving Information about HVAC Systems.” J. Comput. Civ. Eng., 28(1), pp. 40–49. Gao, T., Ergan, S., Akinci, B., and Garrett, J. 2014. "Evaluation of Different Features for Matching Point Clouds to Building Information Models." J. Comput. Civ. Eng., 04014107. Ying, Y., J. H. Garrett Jr., J. Harley, I. J. Oppenheim, J. Shi, and L. Soibelman (2012) "Damage Detection in Pipes under Changing Environmental Conditions using Embedded Piezoelectric Transducers and Pattern Recognition Techniques," Journal of Pipeline Systems Engineering and Practice, Special Issue for International Conference on Pipelines and Trenchless Technology, doi:10.1061(ASCE)PS.1949-1204.0000106. Taneja, S., Akcamete, A., Akinci, B., Garrett Jr., J.H., Soibelman, L., East, E.W., “Analysis of three indoor localization technologies for supporting operations and maintenance field tasks”, ASCE Journal of Computing in Civil Engineering. Shahandashti, M.S., Razavi, S.N., Soibelman, L., Berges, M., Caldas, C.H., Brilakis, I., Teizer, J., Haas, C., Garrett Jr., J.H., Akinci, B., Zhu, Z. (2011) “Data Fusion Approaches and Applications for Construction Engineering,” ASCE Journal of Construction Engineering and Management, 137(10): 863-869. Taneja, S., Akinci, B., Garrett, J.H., Soibelman, L., Berges, M., Atasoy, G., Liu, X., Shahandashti, S.M., Anil, E.B., Ergen, E., Pradhan, A., Tang, P. (2011) “Sensing and field data capture for construction and facility operations,” ASCE Journal of Construction Engineering and Management, 137(10): 870-881. 2009 Elected to ASCE Fellow Status. Fellows occupy ASCE's second-highest membership grade, and fellow status must be attained by professional accomplishments via application and election by the Membership Application Review Committee. Carnegie Mellon University College of Engineering Dean Jim Garrett is among the Carnegie Mellon presenters at the World Economic Forum Ideas Lab in Tianjin, China. His presentation focuses on Smart Infrastructure, a field that is a blend of our built infrastructure, with many types of networked sensors that collect data over time and space, and sophisticated analytical techniques used to predict and visualize the conditions of that infrastructure. In other words, smart infrastructure provides the early indicators of trouble that would compel decision-makers to act in a more timely and effective manner.